Safely clean your Entire Collection! Easy to Use, Safe and Reliable! • Keep your Vinyl in peak playing condition! No Questions Asked Total Satisfaction Guarantee! 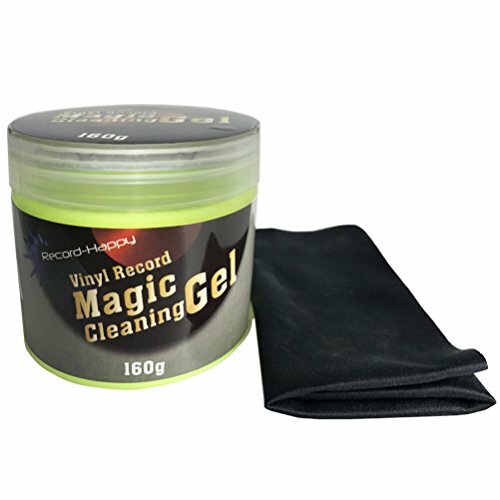 If you are not 100% satisfied for any reason, we will replace your Record Cleaning Gel for free or refund the full purchase price, No hassles and No questions asked. So order yours NOW! In fact consider getting Two, it makes a Perfect Gift for your Record Collector Friend! BECAUSE YOUR VINTAGE COLLECTION deserves a throughout maintenance with the best products available from Record-HappyTM; Relax and enjoy your favorite music, classical or contemporary, nothing compares with the feeling of placing a pristine record on the turntable and as it begins to spin, that exciting sensation of the needle going thru every single song. It's easy to listen to music by a computer or another way, but the beauty of vinyl is really unique! View More In Disc Cleaners. If you have any questions about this product by Record-Happy, contact us by completing and submitting the form below. If you are looking for a specif part number, please include it with your message. Record Cleaning Velvet Brush - with Anti Static Solution Fluid and Stylus Cleaner by Record-Happy. Extend Life, Improve Fidelity and Keep your Prized Vinyl Collection LPs like New !